An Intelsat satellite on the way to an orbit over the Indian Ocean will link Europe, Africa and Asia with video and voice services and relay UHF communications for U.S. and Australian defense forces deployed in Afghanistan. Equipped with 48 C-band and 24 Ku-band transponders, the Intelsat 22 satellite will boost Intelsat's coverage for government, media and network customers. The communications payload is tailored for video, voice and data services. 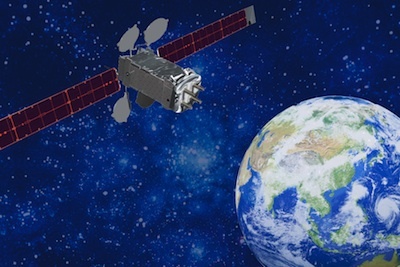 Intelsat says airliners and ships will use broadband connectivity routed through the new satellite, which will enter service in May. It also carries a UHF communications payload for the Australian Defence Force, which will provide the U.S. Navy about one-half of the 18-channel unit's capacity. "The launch of Intelsat 22 is a significant milestone in many respects, not the least of which is its role in demonstrating the viability of hosted payloads in delivering customized space solutions for government users," said Dave McGlade, CEO of Intelsat. "On time and on budget, the delivery of the UHF payload for the Australian Defence Force successfully demonstrates how hosted payloads are embraced by governments seeking cost-efficient access to space." Maj. Gen. Tim McOwan, the Australian Defence Force's senior attache in the United States, said the UHF payload on Intelsat 22 will replace capability lost on the Leasat 5 satellite when it is retired in 2013. According to McOwan, the UHF payload will help fill a communications gap in the Indian Ocean region, including the Afghanistan theater. The Australian military finalized a nearly $500 million purchase of the UHF payload in April 2010, agreeing to an exchange with the U.S. Defense Department for access to about half of the UHF system on Intelsat 22. In return, Australia will receive UHF satellite communications from legacy U.S. government satellites over the Pacific Ocean after the Optus C1 satellite finishes service in 2018. McOwan said the decision to pursue a hosted payload instead of procuring a dedicated satellite for the UHF communications mission saved money and accelerated its availability. "If we had been forced to abide by the usual government procurement methodologies, it is highly likely we would have not met the compressed timeline which we had to meet," McOwan said. "The cost of an additional payload on a commercial satellite is marginal compared to the total cost of ownership." Vince Squitieri, the U.S. Navy's communications program manager, said the Defense Department's aging UHF satellite infrastructure will be refreshed by the launch of Intelsat 22 and the first next-generation Mobile User Objective System satellite in February. The Navy's other UHF satellites are more than a decade old and reaching the end of their design lives. "We have a lot of aging UHF satellite communications capabilities out there now, and this will meet a critical need for the U.S. Navy," Squitieri told Spaceflight Now. While the U.S. military must preserve resilient communications, Squitieri said, much of the Pentagon's bandwidth needs can be met with flexible commercial options. "At the end of the day, the user really doesn't care where the service is coming from," Squitieri said. "The requirement is there, and what's important is satisfying that requirement." 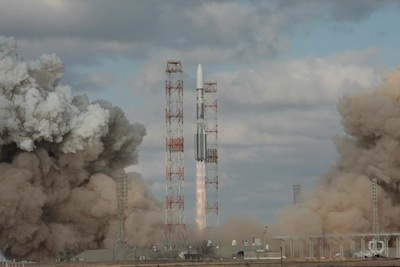 The 6.9-ton satellite lifted off aboard a Proton rocket at 1210 GMT (8:10 a.m. EDT) Sunday. The Proton's Breeze M upper stage guided the spacecraft into a high-altitude transfer orbit stretching up to 40,000 miles high. It was the first launch of a Proton/Breeze M into a so-called super-synchronous transfer orbit, which reduces the propellant needed to reach Intelsat 22's final operational position. Eight burns of Intelsat 22's on-board engine will circularize the satellite's orbit at an altitude of about 22,300 miles. Intelsat 22 should arrive in geosynchronous orbit over the equator by mid-April, according to Alex Horwitz, an Intelsat spokesperson. Built by Boeing Co., Intelsat 22 will replace the Intelsat 709 satellite launched in 1996. Its ultimate orbital position will be at 72 degrees east longitude. "In addition [to the UHF hosted payload], as Intelsat 22 enters service, its customized beams will further progress our global mobility broadband fabric, allowing always-on broadband for ships and planes traversing the world's busiest transport routes," McGlade said. "Intelsat delivers broadband infrastructure everywhere, and the successful launch of Intelsat 22 delivers enhanced satellite capacity for telecommunications leaders in Asia, the Middle East, Africa and Europe, such as the UAE's Etisalat and Ethio Telecom of Ethiopia." Intelsat 22 is the first in a new series of Boeing-built commercial satellites. Based on the Boeing 702 platform, the new medium-power spacecraft bus offers a less expensive, optimally-sized medium-class satellite for many communications applications, according to the company. "The launch of our first 702MP for Intelsat builds on a partnership that spans more than 40 years," said Craig Cooning, vice president and general manager of Boeing Space and Intelligence Systems. "In addition to the Intelsat 22 commercial payload that will deliver services in C- and Ku-band, the hosted payload will provide the Australian Defence Force with much-needed service at less cost and in a fraction of the time it typically takes to deliver a traditional military satellite."